Machine identity: These instructions are provided for descaling a traditional espresso machine with water reservoir and has a coffee boiler and separate steam thermoblock for steam. Your espresso machine must have a single internal boiler that provides hot water for espresso extraction and hot water delivery through a hot water valve AND a separate thermoblock for steam. the machines in this class are Ascaso Steel DUO series machines, as well as the Quickmill Silvano. This procedure is not for espresso machines called heat exchangers, nor double boilers. Under the steam wand, hot water wand, and grouphead, please place an 8 oz or larger cup. Press the power switch to ‘on’. If there is a separate power switch for the steam thermoblock, please power to ‘off’. Press the coffee switch to ‘on’. After 6-8 ounces of solution has dispensed through the grouphead, please press the coffee switch to ‘off’. If applicable. press the hot water switch to ‘on’. After 6-8 ounces of solution has dispensed through the hot water wand, please press the hot water switch to ‘off’. 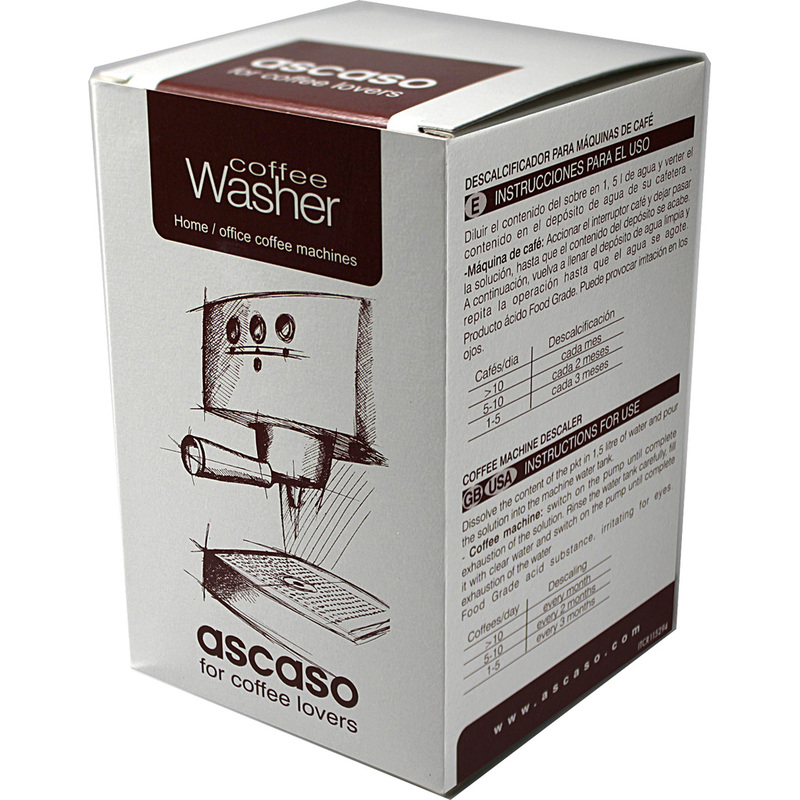 (Ascaso Steel DUO) If the machine has a switch for the steam valve, press the steam valve switch to ‘on’. After 6-8 ounces of solution has dispensed through the hot water wand, please press the steam valve switch to ‘off’. If there is a separate power switch for the steam thermoblock, please power to ‘on’. (Possible other machines in this category) If the machine has a knob for the steam valve, rotate the steam knob to open the steam valve and engage the pump. After 6-8 ounces of solution has dispensed through the hot water wand, please rotate the steam knob to close the steam valve. If there is a separate power switch for the steam thermoblock, please power to ‘on’. Let machine sit idle for no longer than 20 minutes. Longer periods of time can damage the machine. During this time, you can perform 11, 12, 13, and 14. Remove and rinse 8 ounce cups and place back in place. Remove reservoir, rinse with water, wipe down reservoir hoses with a clean wet rag. Fill reservoir with water and place into machine. Repeat steps 6-10 for rinsing except to rinse, you need to double the quantity of fluid ounces indicated for proper rinsing. The machine has successfully been descaled and rinsed.